Discussion in 'Android Devices' started by 1080p, Apr 3, 2015. Charges my S6 Edge just as fast the Samsung wall plug adapter. Comes with a "charge-only" style USB cable. A steal at $12. My Prime also shipped it 1 Day for free too! There's no way it could charge as fast as a wall charger. Well... I believe so. GS6 gives you a notification that tells you how much time left until it's fully charged. I plugged the phone into the wall charger and the phone said 39 minutes till full. I immediately plugged my phone into my computer and it said 1 hour 40 mins till full. Then I setup the Qi Charger and it said 39 mins till full. The included cable with the Qi charger is the "charge-only" type, so the pinout of the USB doesn't transmit data... so the phone will charge in AC mode on any USB port with that cable. I am all setup at my desk with the Qi charger plugged into my computer and it charges fast. My biggest complaint with wireless chargers is being able to use the phone while charging. Sure, you can tap on it while it's sitting on the charger, sorta; but it's a whole lot easier if it's plugged in. 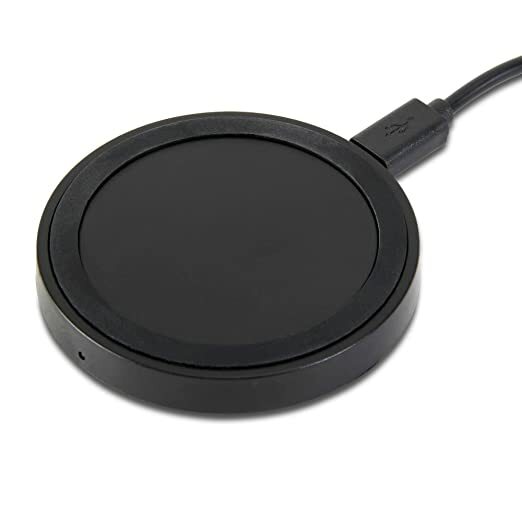 Is this similar to the wireless charger that Best Buy offered with S6 pre-orders? I will have to pick one up. Thanks.